Evaluate websites based on Currency, Relevance, Authority, Accuracy, and Purpose. Evaluate websites for Authority, Accuracy, Audience, Bias, Currency, and Design. False, misleading, and biased news sources are an ongoing problem. Learn how to be an information detective and actively question the news sources that you see. Use this worksheet to systematically evaluate your information source(s). Reliability of Sources discusses what makes information reliable and explores one model for evaluating reliability (CRAAP). You'll learn to point out and apply criteria that can be used to judge the reliability of information. Evaluating News Sources If you're like most people, you have no shortage of news articles reaching you each day. Whether retrieved via traditional channels (such as newsprint, radio or television) or shared via social media outlets, how confident are you in your ability to distinguish objective, reputable articles from those that are biased or more questionable? 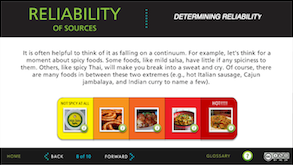 Test your evaluation skills in this interactive lesson.